Caesars – Daily Deposit $40, Get $20: Use Promo Code DAILY20 and Deposit $40 to Receive a $20 Bonus – Every Day of the Promo! At NJOnlineCasino.com, we offer a bunch of exclusive tools to help you get the most fun and value out of your play. We track the nearly two dozen online casinos and poker sites in New Jersey for the best free money casino bonuses. Why make a deposit if someone wants to give you money for free? Want to know when New Jersey’s online casinos add new games? We did too, so we built a system for tracking them! Get caught up on the latest games with one click. There are hundreds of promotions at New Jersey’s online casinos every year. We take the guesswork out by evaluating and rating the best bonuses and promotions. At NJOnlineCasino.com, we’ve answered thousands of user questions. Below are the top five questions we receive. Click on any to expand the answer. If you have more questions, you can always chat with us (bottom right) or send us an email. 1. How do I tell a legal NJ online casino from an illegal one? It’s simple. Legal online casinos in New Jersey are regulated by the NJ Division of Gaming Enforcement. At NJOnlineCasino.com, we only feature casinos that are licensed and legal in New Jersey. Look out for other sites that promote casinos as “legal” when they really aren’t. Learn more here. 2. Who can play at NJ’s legal online casinos? Anyone 21 and older and is located within the state at the time can play. You don’t have to be a resident — you only have to be in the state. 3. How do I make a deposit at NJ’s legal gambling sites? Each casino handles things a little differently, but the above should give you a general idea of how to deposit at NJ’s casino sites. 4. Who regulates legal online casinos in NJ? The industry is overseen by the New Jersey Division of Gaming Enforcement (DGE), the same agency that regulates Atlantic City casinos. The NJ casino must have a license from the DGE to offer legal online gambling. The DGE maintains a list of licensed online gambling sites on its website. All online casinos are operating in NJ partner with one of the land-based casinos in Atlantic City. 5. Why do NJ casinos ask for personal information at sign-up? Because they are required to by law, for casinos to control fraud, money laundering and other types of abuse, such as underage players making accounts; it’s important they verify you are who you say you are. Usually, the information requested is fairly limited and may include your address, some part (or all) of your Social Security number, and phone number. Your information is encrypted and protected just as it is when you bank or shop online. Powered by the largest daily fantasy sports site in the US, this new online casino offers the convenience of a shared wallet. Bettors can step out of the single-game wagering arena to play a few hands of blackjack without leaving the app. But in February 2019, BetAmerica online casino and sportsbook launched in New Jersey. The app from Churchill Downs via the Golden Nugget license features a robust slate of casino games, but its primary focus appears to be NJ sports betting. With lifetime revenues in the billions, NJ online casinos show no signs of slowing down. And Atlantic City casinos are basking in the success and looking ahead to the future. Sports betting has brought a whole new level of revenue into the fold. As of this writing, there are 10 land-based sportsbooks with 13 NJ online sports betting sites, but that will likely change soon. A lot of those online sportsbooks are integrated into a well-established NJ online casino. The cross-sell of the two platforms obviously benefits both sides. Meanwhile, NJ online casinos continue to pack in the promos and games. New games are showing up at a lot of casinos, including 888 Casino and Mohegan Sun. Of course, the leader in total games remains Golden Nugget at more than 600. But there are some close contenders for the title spot. We have a simple goal: To let you know about the best free money bonuses with no deposit required at New Jersey’s legal online casinos. 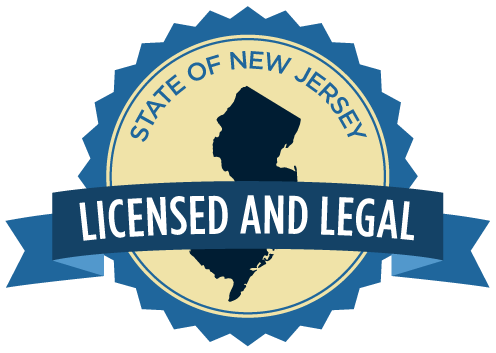 We monitor the nearly two dozen different legal New Jersey online casinos and online poker sites licensed by the NJ Division of Gaming Enforcement for promotions. Our site is updated daily. NJOC is not owned by or affiliated with any of the casinos mentioned or reviewed. We may receive compensation if you visit the casinos reviewed on this page. That compensation does not influence the content of our reviews, which are authored by writers who are paid a flat rate that is independent of any commission from casinos. Our commissions are in no way related to the content of our reviews or information (i.e., casinos cannot “buy” a better review). Every effort is made to present information that is accurate, objective and of greatest use to the reader. More questions? No problem. Get in touch. Bet with your head, not over it. Call 1-800-GAMBLER, if you have a gambling problem. This page was last verified on March 29, 2019.